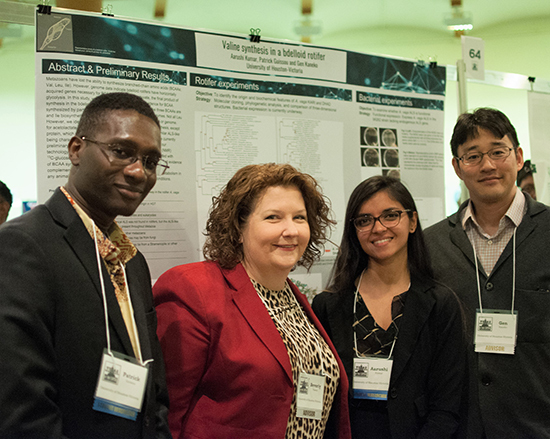 Patrick Guissou, a UHV graduate student from Africa, left; Beverly Tomek, associate provost and dean of University College; Aarushi Kumar, a senior from India; and Gen Kaneko, an assistant professor of biology, pose on Monday after displaying a research poster during Texas Undergraduate Research Day at the Capitol in Austin. Guissou, who attended the event as an additional student researcher, worked with Kumar on the research project under Kaneko’s supervision. The one-day conference showcased high-quality research posters created by Texas undergraduate students. The posters were displayed for Texas legislators and the public to view.